The Learning Breakthrough Program™ addresses brain processing issues that are critical to brain injury and stroke rehabilitaion by improving sensory integration coordination that directly impacts optimal motor skills so that one's internal control system is balanced and repaired along with the outside (or physical) repair. Traumatic Brain Injury (TBI), also called acquired brain injury or simply head injury, occurs when a sudden trauma causes damage to the brain. Symptoms of a TBI can be mild, moderate, or severe, depending on the extent of the damage to the brain. Stroke and brain surgery patients are often treated with the same types of therapies as TBI patients since the brain often suffers from the same types of deficits and requires the same types of treatment in order to be healed. "Research is beginning to indicate that there are links between synaptic activity in the brain and the brain’s ability to learn (be trained), adapt and repair itself. Studies show that lab animals experience changes in their brains as the result of learning a new skill. This is important for those involved in brain injury and stroke rehab because it indicates that activities that stimulate synaptic, or neural, processes are necessary for learning new skills and allowing other parts of the brain to begin to compensate for the injury." Activities like those of the Learning Breakthrough Program™ that involve precise balance, space-time judgments, and a feedback component are likely to be the most powerful and effective activities available for improving brain processing efficiency and sensory integration ability. When a person engages in balance activities that require motor skill and sensory integration abilities, the brain utilizes neural networks to organize and execute the activities effectively. As the difficulty of an activity increases the number of neurons the network requires to perform the task increases. As the number of neurons in a network grows, the network becomes more efficient. Consequently, balance activities, which incorporate increasing levels of difficulty on the Belgau Balance Board, have the effect of constantly building and creating more extensive neural networks. 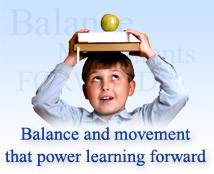 Because the neural networks that are affected by balance activities are the same ones that are responsible for the resolution of the brain’s visual, auditory, motor, and sensory processes, balance activities that promote motor skill development improve the efficiency of the brain. The existence of these processes give us the ability to lead normal productive lives. It follows that therapies which increase the resolution and efficiency of these systems can have rehabilitative effect among those with traumatic brain injury or stroke. Rehabilitation professionals who treat stroke and brain injured patients know the important role sensory integration and balance therapies have in improving the quality of a patient's life. The Learning Breakthrough Program™ is a program designed to improve brain processing function through the integration of motor skill activities and balance. Click here to read about how the Learning Breakthrough Program™ works.